1. 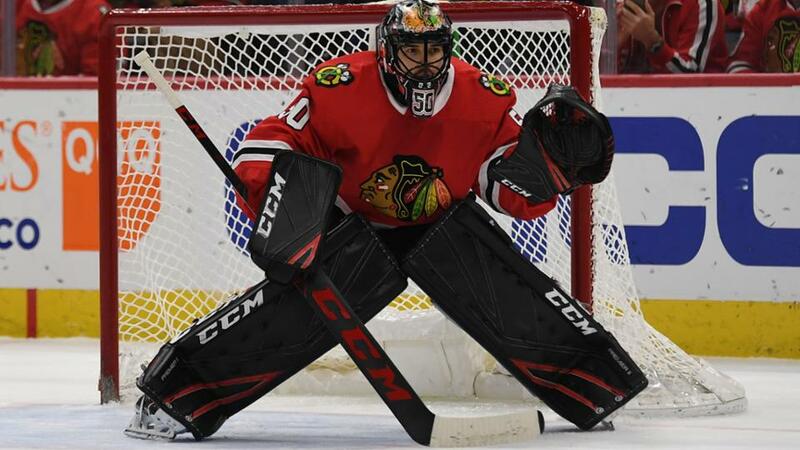 Will goalie Corey Crawford be healthy? Crawford, who missed the second half of the season with an undisclosed upper-body injury, said July 27 that he was not 100 percent healthy yet but it's possible he'll be ready for training camp. The 33-year-old was 16-9-2 with a 2.27 goals-against average and .929 save percentage in 28 games. He last played in a game Dec. 23, when he allowed three goals on seven shots in a 4-1 loss to the New Jersey Devils, and hasn't been on the ice since Feb. 12. The four other goalies who had at least one decision for the Blackhawks in 2017-18 combined for a 17-30-8 record, leading to the July 1 signing of free agent Cam Ward to give Chicago a backup goalie with starting experience in the NHL. 2. Will Henri Jokiharju make the Blackhawks out of training camp? The 19-year-old defenseman had his second strong season with Portland of the Western Hockey League in 2017-18, scoring 71 points (12 goals, 59 assists) in 63 games. General manager Stan Bowman said it's possible he could make the NHL roster, but coach Joel Quenneville has often said that defensemen need more time to develop and be comfortable in the NHL. The Blackhawks have liked what they've seen from Jokiharju, their first-round pick (No. 29) at the 2017 NHL Draft, as he's adjusted to the bigger North American ice surface since coming over from Finland. 3. What happens if they get off to a slow start? For all of the personnel changes the Blackhawks have made in recent seasons, Bowman and Quenneville have been in their respective positions for nearly 10 seasons. Last season, the Blackhawks missed the Stanley Cup Playoffs for the first time since 2007-08, and owner Rocky Wirtz told Crain's Chicago on June 4 that "nothing lasts forever" and changes could come around the holidays if the Blackhawks had a bad start. However, on July 27, Wirtz told the Chicago Sun-Times that he wasn't sending a message to Quenneville and Bowman with those comments. Nevertheless, Chicago has had a lot of success since Wirtz became chairman in 2007, including winning the Stanley Cup in 2010, 2013 and 2015. It's hard to believe that if the Blackhawks falter, changes won't be made.